iRobot has announced that its RP-VITA autonomous remote presence robot, co-developed by InTouch Health, has received clearance from the U.S. Food and Drug Administration (FDA) for use in hospitals. RP-VITA was developed as part of a suite of remote presence medical robots by iRobot and InTouch Health. 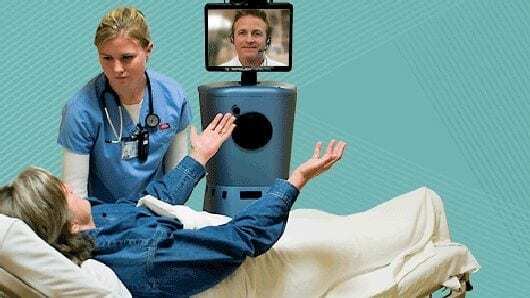 The robot provides the usual telemedicine remote presence functions, such as an audio/visual connection between the patient and the doctor in a form factor that suggests something of actual presence. It also enables smooth communication with hospital staff and access to medical chart information. The most remarkable ability of the RP-VITA, however, is that it can proceed from point to point in the hospital autonomously. The designers realized that they should not waste the time of either the physician or the hospital staff in guiding the robot around the hospital – that would rather defeat the goal of using the time of live people efficiently. RP-VITA was given the ability to move around the busy halls of a hospital by itself. The robot knows the layout of the hospital, keeps track of its own location, and uses an array of sophisticated sensors and programming to autonomously move about a busy space without interfering with people or other objects. The doctor need only click on the location of the next patient to visit, and RP-VITA signals when it has arrived on site. The video at the bottom of the page shows RP-VITA making its way around a hospital. The FDA clearance specifies that RP-VITA can be used for active patient monitoring in non-surgical patients, and before, during, and after surgical care. It can also be used in testing patients, including cardiovascular, neurological, prenatal, psychological and critical care assessments and examinations.